It's been a few weeks since we could do more on the cabin project, but we made come great headway today. 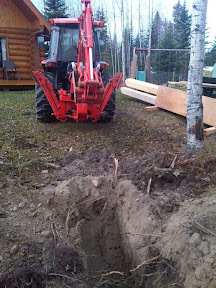 My friend Matt came over with his farm-size Kubota and used the backhoe to dig an 18"-wide by 30"-inch deep trench from the house to the cabin. It was amazing to watch the skill needed for what might seem to be a simple job... And it brought out way more dirt than I'd expected. According to Jim, our local electrician, Telus recommends a foot between their communications lines and any power lines. The 18 inches leaves us some room to play. I plan to run phone, Ethernet and a satellite cable through a conduit.